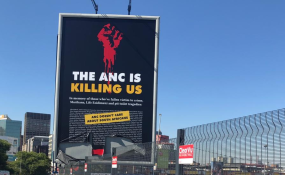 The controversial billboard commissioned by the Democratic Alliance that features a list of victims' names from the Esidimeni tragedy, the Marikana massacre. The DA unveiled posters in Cape Town on Monday to encourage potential voters to register to vote to "keep the ANC and EFF" out of government in the Western Cape. DA premier candidate for the Western Cape Alan Winde and campaign spokesperson on corruption Phumzile van Damme put the first "Register to keep the ANC and EFF out of the Western Cape" poster on a pole in Wale Street, opposite the DA-controlled Western Cape legislature. Asked if the poster was negative campaigning - asking voters to vote against a specific party - Winde said it was a "wake up call". "This province is under threat and we must make sure people register to vote," Winde said. He said people were opting to come and live in the Western Cape because of the way it is governed. In the accompanying statement, he said "we cannot allow our province to go backwards and for the progress we have made to be eradicated". He said the DA was aiming to go into its third term in government after the election, having taken over the province from the ANC in 2009. He said in its first term, the DA stopped corruption and ensured that the province's money was spent properly. The first term was about governance. The second term was about service delivery. "Over the next five years, our plan will be to build on the progress we have made by continuing to keep corruption out, working hard to grow the economy so more people can have fair access to real, long-term jobs, and to do everything we can to speed up the delivery of services," Winde said. "In addition, we plan to deal with the two remaining pieces of the ANC's failed legacy in the Western Cape - crime that is out of control and the failing rail service." The DA has been advancing the narrative that the EFF and ANC are in cahoots and Winde urged voters not to allow that partnership to succeed in the province. "Don't allow the ANC and EFF to take control of the Western Cape." In what can only be described as a pre-emptive strike in the propaganda war, ANC provincial secretary Faiez Jacobs released a statement on Sunday evening about the Winde's planned press conference. "Tomorrow (Monday) the DA will indulge in yet another exercise in sanctimonious self-glorification, obfuscation, lies and pats on the back when its candidate for premier in the Western Cape, Allan Winde (sic), will try to put some lip gloss on his has-been party's service delivery record in the province," the statement read. "No matter what political half-truths Winde will try to peddle tomorrow we are ready for the DA, a party of has-beens that is running scared of the effect of President Cyril Ramaphosa on the electorate. They're losing support among all groups and they are panicking," said Jacobs. "And when they panic they bring out lies, false claims and accusations and refuse to own up for their failure. Tomorrow it will be more of the same when Winde addresses a press conference. It will be more of the same old lies. That's what they're good at." This upcoming weekend will be the last chance for potential voters to register to vote in the upcoming election. Eligible voters have Saturday and Sunday on which to register for the 2019 national and provincial elections.